Planet Thrive » Don’t have a backyard for gardening? Borrow one! Don’t have a backyard for gardening? Borrow one! The weather finally warmed up here in Minneapolis, and over the weekend I dug my hands into the Earth for the first time this year. I threw off my coat and spent about 10 hours in the garden; it felt amazing to be out in the sun, connecting with the soil, spending time with the land that will provide me nourishment. It was hard, hard work, and fed my soul. Today I’m terribly achy and sore, but it is worth it. I live in a small apartment, and there is nothing but pavement and an alley out my backdoor. Last year I gardened in a friend’s backyard; she has since moved in with her fiancé and out of the apartment with the great backyard garden. I thought I’d be heading out to Portland this summer for school this fall, and didn’t think I’d be around this summer to garden anyway, so I hadn’t made other plans. However, I recently decided that I need to delay my school plans until 2011 (I need my health insurance and current income to pay for Lyme treatment). That meant I needed to find a place to garden. My search hit a lot of roadblocks: all the community gardens were full, my neighbors don’t have space, and none of my friends did either. So, I decided to put up an ad on Craigslist, asking for someone to let me use their yard to garden. Within two weeks of my post, I got an email from a lovely woman who I will call H. H lives with her male partner R, and the two of them have a house with a lovely little yard a mere mile from my apartment. They have about 150-200 square feet of garden space, and don’t do anything with it, since they are gone most of the summer at their cottage on the East coast. They also grow blackberries, black raspberries, raspberries, 5 varieties of blueberries, red currants, gooseberries, rhubarb, and apples. Hmn, so guess who gets to use all that space and eat all those berries? I am in awe at the generosity, trust, and support that H and R are giving me on this little (um, big, actually) garden project I am embarking on. I met with them about a month ago to meet them, talk it over and see the space. On Saturday I went to the yard for the first day of action. We all worked together to clean it up, chatting all the while. It was wonderful to learn more about them and the history of the yard. The garden was quite overgrown, and required a lot of work. I raked and dug and weeded and tilled. I cleaned up their compost pile, using the rich black compost and some organic manure to fertilize the soil. I trimmed back grapevines and picked up old berry plant stems. I wrestled with the monster mint patch that will take over the garden next to the garage. I restrung the pea trellis. In between work, I spent some quiet time sitting on the picnic table, listening to what the ground told me to plant where and reading through the Victory Garden Handbook. I think that H and R think I’m kind of eccentric, or least a little obsessive (both might be true). Finally, on Sunday afternoon, as the sun faded behind the house, I put the first seeds in the ground, said a blessing, and covered them gently with the dirt that I tilled by hand. Sitting there in the garden, covered in dirt, I felt better than I have in the last 6 months. I felt energized, despite the aching in my joints and muscles. I felt alive. I am most curious about the beetberry – it is in the goosefoot family, along with spinach and beets, and grows in fairly large, bushy stalks. You can eat the leaves, the bright red berries, and even the seeds! I imagine the seeds are much like quinoa – another favorite member of the goosefoot family! 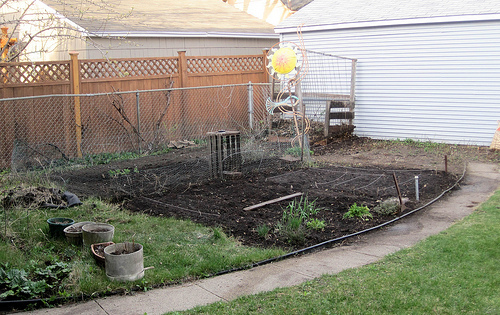 The garden has a few other things growing that survived the harsh Minnesota winter, and came back this spring, which is lovely to see; wintered kale, chives, garlic, thyme, and parsley, as well as a patch of monster mint that will take over the garden next to the garage. I battled the mint in an attempt to free up space for my peas, and found myself bathed in a mint perfume. Lovely! Mint is a real pain, but it sure does smell – and taste – good. Mint tea for me, all summer long. Mint in salads. Mint on lamb. Mint mint mint. I have lots of plants to put in other things as the summer goes on, I got a little carried away!I have a lot of heirloom seeds, and will be buying some plants later on in the season. I will be putting in carrots, radishes, beets, kale, chard, and collards next weekend. Other plants will have to wait until May, after our last chance of frost is over. Oh, Minnesota and your short growing season, how you tease me. Anyway, we’ll see what I have room for – I think I have a list of about 20 different things I hope to grow! I will hardly need to buy vegetables this season, I think… fun! On another note, I feel like I was run over by a truck. I totally overdid it, and definitely feel severe pain all over my body today. I could hardly get out of bed! I was all inspired by Spring and just kept working through the exhaustion, but definitely do not feel good today. I do not know my limits well at all. Tilling and digging is hard work for anyone, but I think that I am especially sensitive, and definitely kick myself in the a**. Oops. Epsom salts, yoga, and early bedtime for me tonight! I keep sending positive vibes to me seeds, and look forward to sharing my garden with you through this spring, summer, and fall! Kim Christensen is a twenty-something, ex-vegetarian, gluten-intolerant, vegetable-loving creative spirit. She is growing food, cooking up delicious allergy-free dishes, and recovering from Lyme disease in Minneapolis, Minnesota. 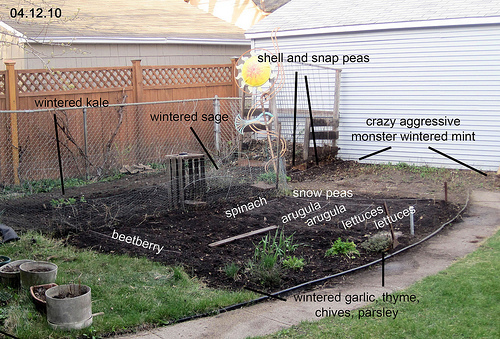 You can follow her garden as it grows in her Garden Journal on her “Eat. Heal. Live.” website affairsofliving.com. I am loving your descriptions of everything here. I really like your “outside the box” thinking for finding a place to garden. Perhaps I may do this from the other direction and get some help in my future garden! I look forward the hearing about, and seeing, your garden development this year. Working with soil is SO… what is the word? Connecting with the real world. Relaxing…if you have someone to help with the digging Soul-invigorating. Nurturing. Thank you for sharing both your idea of how to find a shared garden, and your pictures. Lovely. Growing your own food is one of the most radical (and simplest) acts a person can take today to improve their health and future security. The benefits are manyfold: purity control, local diet, financial savings, smaller footprint, earth healing, personal empowerment and so much more! Our DIY Organic Homestead column will share tips from organic farmers and do-it-yourself homesteaders around the world to help even the greenest growers overcome the physical, financial, and mental obstacles to growing your own food.